The Election Commission (EC) of India and the Narendra Modi government may be under scanner (click HERE) for "undermining" transparency by refusing to part with any information on the controversial Electoral Bonds scheme, allowing political parties fund their activities secretly. Yet, surprisingly, in its new report, a top NGO, "working" on democratic reforms, has used official figures to analyze Gujarat MLAs' spending during the 2012 state polls, without once recalling the huge black money used during the elections. Reasoning the use of the figures the MLAs have provided, and refusing to doubt them, the NGO, Association of Democratic Reforms (ADR), has used a disclaimer: "Information about MLAs in this report has been taken from the election expenditure statements filed by them and submitted to the Chief Electoral Officer, Gujarat. ADR does not add or subtract any information, unless the EC changes the data." Considering all information the EC provides “verified”, ADR says, "No unverified (sic!) information from any other source is used", adding, it uses only "copies of affidavits obtained from the CEO’s website". It goes on, insisting the MLAs’ information should be treated as final: "In case of discrepancy between information in this report and that given in the election expenditure statements, the information reported in the election expenditure statements filed by MLAs should be treated as correct." Ironically, the report comes close on the heels of the Union Finance Ministry, EC and Reserve Bank of India (RBI) replying to a Right to Information (RTI) plea that they don’t have any information about the Electoral Bonds schemes. Announced in the Annual Budget in February 2017, the Modi government amended three laws relating to elections, income tax and RBI to create Electoral Bonds for monetary donations to political parties. Effective April 2018, snybody would be able to buy bonds in the form of bearer bonds from a designated commercial bank for any sum of money and donate it anonymously to a political party. Interestingly, the Gujarat MLAs' report comes despite the fact that the ADR has filed a Public Interest Litigation along with another NGO, Common Cause, in the Supreme Court, challenging the Electoral Bonds on the ground that they have opened doors to unlimited, unchecked funding of political parties. The ADR report claims, out of 143 MLAs analyzed, 65 (45%) MLAs spent election expenses of less than 50% of the expense limit (Rs 16 lakh) during the 2012 polls, and the only MLA who exceeded the expense limit was Satishbhai Patel (BJP) from Karjan constituency, He spent Rs 36.76 lakh, or 230% of the expense limit. According to ADR, "Based on the election expense declarations of 143 MLAs from Gujarat Assembly, the average amount of money spent by them in the elections is Rs 8.70 lakh, which is 54% of the expense limit", adding, "Out of the total funds received by MLAs, 92% funds were raised from political parties, 6% were raised by MLAs themselves and 2% funds were raised from other sources." 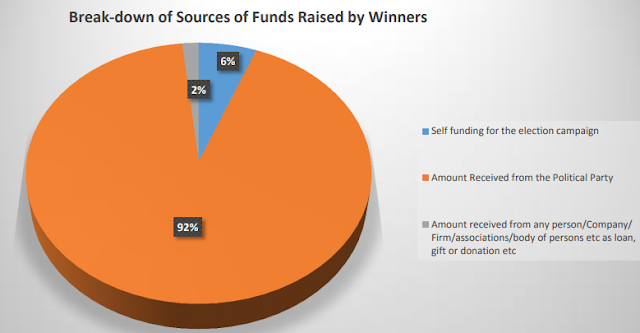 Even as refusing to define “other sources”, the report continues, “56 (39%) MLAs have declared that they have not received any funds from political parties. 137 (96%) MLAs have declared that they have not received any funds from any person/ company/ firm/ associations/ body of persons etc. as loan, gift or donation etc." Refusing to even suggest that black money may have been used in the 2012 elections, the report says, "Out of the 143 MLAs analyzed, 4 (3%) MLAs have declared that they have not spent any amount on public meetings, processions etc. 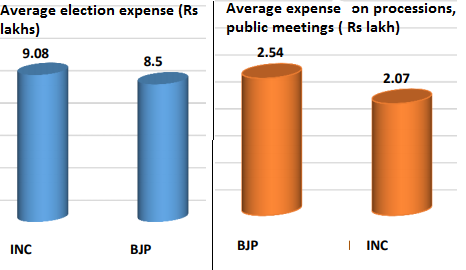 ", and "the average amount spent by 143 MLAs from various parties on public meetings, processions etc. is Rs. 2.33 lakhs." It adds, the "143 MLAs had spent Rs12.44 crore through their own funding, party and through other association or an individual. Political parties spent Rs 91.68 lakhs on 42 MLAs. There are 101 MLAs who have declared that their political parties have not spent any amount for their election campaign." Very good appreciable research and nicely written piece. Congratulations. Good to know these things even though this refers to just one state. I wouldn't be surprised if other states have similar stories with slight variations in figures. When will the electoral reforms actually take place? BJP claimed to be a corruption-free party but isn't this also an aspect of corruption?